Pigeons have been raised for centuries. Pigeons are very smart, even more intelligent than doves. They can easily be tamed and trained to the hand, as they have lost their fear of humans. First of all, when you buy a pigeon, look at the pigeons and try to hand feed them in the pet store cage. Never look for the most beautiful, look for the most sociable and fearless one. It is also more convenient to buy them as a mated pair. Set your pigeon cage outside of your house. Preferably where they can see all the surroundings. Get to know them and treat them with care. Try to hand feed your pigeons so that you can gain their trust. There is a way to tie pigeon's wing feathers without hurting them. You have to hold the pigeon gently and lock the feathers one by one so that they can not fly away. 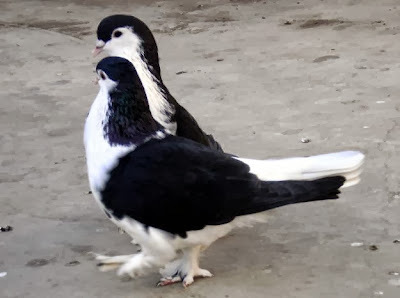 You should then leave them in a room in your presence, feed your pigeons and let them walk around for about 1/2 hour in the morning and evening and catch them and put them back in the cage. This way they will be familiar with their surroundings and they will know you. After about 7 to 10 days you should untie the feathers. When pigeons are about two weeks in their cage, you can open their cage and try to get their attention with some food on your hands. If they don't land on your hands but if they go exploring the surroundings, don't worry they are just curious and will spend their time exploring their "Out of Cage Home". If they fly away, they might come back when they get hungry, but never allow them to free-fly as a predator could get them. Enjoy your pigeons landing on your hands when you feed them! At night, it is preferable to cage your pigeons; this will protect them from possible nocturnal enemies. Put a birdhouse on your wall. Pigeons will make this their new home. Buy more pigeons. The new pigeons will get attracted by your old ones and this will make it easier for the new ones to settle in your home. To encourage your pigeons to eat from your hands, try to imitate their cooing sound so that they can feel secure. It will be even better to let your pigeon pair breed inside the cage first and then let them out of it. Pigeons are very responsible and will not let their young alone. Leave the cage open so that they have access to it.